The Abigail Fillmore First Spouse Gold Coin in proof condition marks the fourteenth coin available in the First Spouse series from the US Mint. The series was authorized by the Presidential Coin Act of 2005 and launched in 2007. Being raised by her mother in the frontier after her father passed away did not stop young Abigail from receiving an above normal education. With the help of her deceased father's library, Abigail became an avid reader and this learning would serve her and her future husband well. At age 21, Abigail met Millard Fillmore. A romance blossomed, but a marriage would not occur for several years as the young lawyer struggled to create a name for himself. Finally, in 1826 the two wed and a couple years later, their son was born followed by daughter Abby.. Abigail continued to teach school after being married to help the family survive. As Millard gained in political prominence, life became easier for the family and Abigail learned the social niceties of the times. Then in 1849, Millard was elected Vice President. After the current President passed away 16 months into his term, the Fillmore's moved into the White House. Social activities were subdued during this time, and most ceremonial functions Abigail left to her daughter. Instead, she spent her time reading and established the White House library while there. 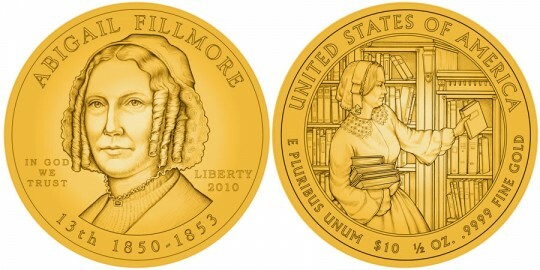 The Abigail Fillmore coin is also available in an uncirculated version. Phebe Hemphill designed and sculpted the portrait of Abigail featured on the obverse of her coin. Also inscribed are the words "ABIGAIL FILLMORE ", "IN GOD WE TRUST", "LIBERTY", "2010", "13th 1850-1853", and the mintmark "W". Abigail Fillmore is shown shelving some books in the White House library which she was instrumental in establishing. It was designed by Susan Gamble and sculpted by Joseph Menna. Included as well are the words "UNITED STATES OF AMERICA", "E PLURIBUS UNUM", "$10", "1/2 OZ. ", and ".9999 PURE GOLD".